Where is the resume field headed? Get some insights on "Trends in Resumes & Career Marketing Communications" from Career Thought Leaders Deb Dib and Louise Kursmark. I've been a resume writer since 1996. Certainly, a lot of things have changed in the careers industry during that time -- and things will continue to change in the future. But the need to assist job seekers with clarifying their job search goals and strategies and developing messaging content to fulfill that role will continue to be needed, both now and well into the future. I am friends with lots of careers industry folks on Facebook. Some of them (Barbara Safani, Jason Alba, Dawn Bugni, Jacqui Barrett-Poindexter, etc.) do a fabulous job with their online brand. Others, not so much. 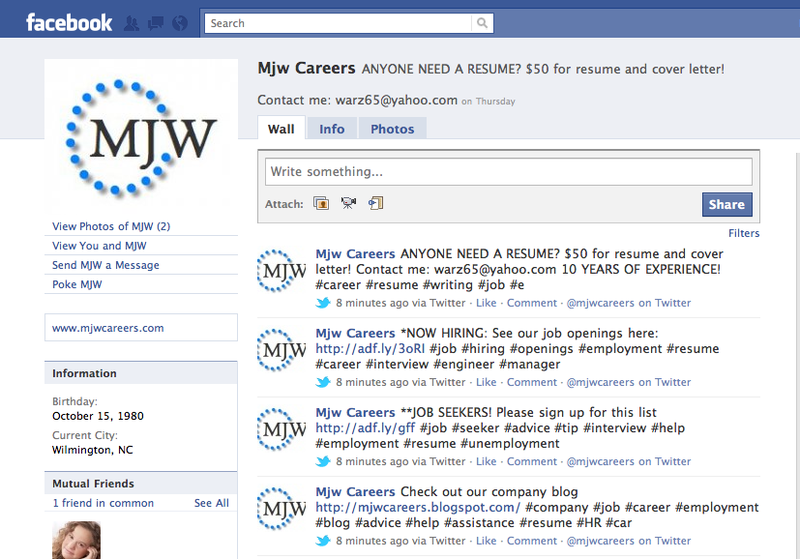 The screen shot on the left is from MJW Careers. I'm not sure who the resume writer behind this page is, but I do know that they write resumes for $50. I am amazed they have 308 friends, since the majority of their posts are ... for lack of a better term ... spam. For the past week or so, once or twice a day, they blast 3-4 posts on Twitter (that are automatically reposted on their Facebook page) about their cheap resume writing services. If you go back through the history, though, you find that they also apparently provide recruiting services. It actually was more interesting when they were posting "people needed" status updates for various *specific* positions versus the basic, blanket posts. 1) Remember the 80/20 ratio. Eighty percent of your posts should be content (resources, opinions, encouragement, links to good articles) etc. Only 20% should be promotional. And don't just rely on Twitter to update your status. Because of the way it's tagged, we can tell when it's a Twitter repost. Give us something original on Facebook every once in a while. 2) Think about your brand. 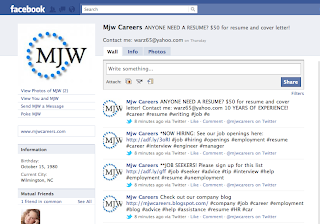 For most resume writers, it's a good idea to set up a Facebook page for your resume writing business. While you can use your personal page to promote resume-related items, you're better off getting "Fans" (or "Likes") for your business page than to add friends to your personal page. You can then drive traffic to your business page by linking to items on your personal page. While he doesn't suggest having your resume written by a professional, he does suggest job seekers don't write it themselves. See his post (dated 10/2/10) here. Careers industry professionals who are members of the Career Management Alliance can receive a significant discount on a subscription to SelectRecruiters, a searchable database of professional recruiters. Founded in 1999, Career Management Alliance is trusted as the world's leading professional association dedicated to linking all divisions within the careers industry. A distinctive community that values the strength of diverse knowledge, the Alliance attracts members from assorted career backgrounds, such as resume writing, career coaching, career counseling, college and university career development, government and military career transition, outplacement, recruiting, and HR. A comprehensive database of thousands of recruiter profiles that allows you to help your clients quickly identify the recruiters best suited to help meet their career objectives. You can search by geography, industry, function, fee structure, and pay range. Tools they will need to create a custom email campaign, allowing your clients to interface with a broad scope of recruiters, instantly — without the added cost of postage. Exclusive access to recruiting firms' physical addresses, making it easy to create custom direct (snail) mail campaigns — including mailing label templates and a spreadsheet for creating the merge! Regularly priced at $649 per year, Standard CMA Members pay only $399 for a one-year subscription to SelectRecruiters — and Professional CMA Members pay only $225. That's a maximum savings of $424. To join Career Management Alliance and take advantage of this exclusive offer, please contact CMA Executive Director, Liz Sumner, directly at 603.924.0900, ext. 640 or via email at liz@careermanagementalliance.com. A few years ago, I was at a resume writing conference with a pair of resume writers who lived on opposite ends of the U.S. They operated a joint website and shared projects so they could answer the phones from 7 a.m. Eastern time to 7 p.m. Pacific time (which was really 10 p.m. Eastern). The one on the East Coast worked from 7 a.m. to 3 p.m. Eastern time and the one on the West Coast worked from 11 a.m. to 7 p.m. Pacific. These two writers would have been competitors if they lived in the same town, but by working together, they served more clients and offered more responsive service than a solopreneur could. I think that's a neat idea. Includes a link to Paul Meyer’s article “How to Communicate Authentically in Print or How to Find Your Voice” – worth a read! Sorry. I took yesterday off from blogging. It was my birthday. – Quantity does NOT equal quality. - Tim is quickly becoming one of my favorite career bloggers. Industry giant Wendy Enelow wrote a fabulous article in the Summer 2009 issue of Resume Writers' Digest in response to the 2008 Resume Writers' Digest Industry Survey. She was particularly disappointed that the survey found that questionnaires are increasing in popularity as a way to collect information from resume clients. For those of you who know me or have read some of my other articles, you know that I am a staunch supporter of doing client interviews to collect the information you need. Although questionnaires can give you some basic factual data, they can never replace the one-on-one interview (done in person, on the phone, or via e-mail). The interactivity of the interview is what makes it so special and so valuable. A client's answer to question #1 impacts what I ask as question #2, his answer to question #2 impacts how I formulate question #3, and so the process goes on. I learn so much more about my clients through interviews -- things that I remember that are reflected in the tone, style, and presentation of the client's resume. Clients always ask me, "How did you know that?" My answer is straightforward...I listen hard and I listen well (and I write it all down)! In turn, I believe that the quality and richness of each resume I write is stronger and more powerful than if I had worked from a questionnaire only. Note that a combination of questionnaire plus interview is great, if that works best for you. Wendy goes on to say that prospective clients find the interview method to be easier than filling out a lengthy questionnaire, and the easier it is for them to work with you, the more likely they will become clients. Considering that ReferenceUSA.com has its roots in my hometown, Omaha (Nebraska), I'm stunned that it took a link to a YouTube video on Hannah Morgan's CareerSherpa Twitter newspaper page to remind me that this service (often available through your local library for free) is a great way for clients to identify prospective employers. Last in a series of posts on Marketing Your Resume Writing Services in a Down Market. One way to ensure your relevance in a downturn is to be a specialist. For example, the federal government is always hiring -- but these jobs require a federal resume. Now is the time to acquire the skills and certification required to serve these clients effectively. Identifying under-served niches and obtaining specialized training or experience will serve you well in a difficult economic market. It will also enable you to protect your prices at a time when you may need to reduce your regular rates to attract "general" clients. Being a specialist in any area will allow you to continue to charge "premium" prices to clients in that industry. And don't forget to target your base of existing clients during a downturn. Repeat clients are already "sold" on the value of the services you offer, and can offer a steady stream of income while you work to develop new clients. Remember: No matter what technique you decide to use, don't wait until you need the business to start marketing. Even if things are going well, it can change in an instant. As marketing expert Robert Middleton notes, "Many self-employed people think that the success of their business is completely dependent upon outside circumstances -- industry trends, the time of year, or the economy as a whole. But be honest with yourself and ask if you are doing the above activities on a regular basis or not. If you're not, it's no mystery why the phone isn't ringing off the hook!" Want the whole article? Buy the issue here. -- This post isn’t from today (it’s from July 21), but it has some good advice for your clients, so it’s worth including in the Best of Today. – Speaking of LinkedIn … and here’s a great way to write a blog post (or an actual article) – put out the word to your colleagues about a common question or concern, and aggregate the responses! Guest Blog Post: E-mail Newsletters: Still Relevant? As social media and blogging have grown more and more popular, there’s been some talk about the demise of the “lowly” email newsletter, or e-zine. Once a staple of business owners using the Internet to market and promote their businesses, it seems that lately the thinking is that they’re not so important anymore. Or, even worse, not as effective. If you’re not familiar, an e-zine can be as simple as a plain text email with a couple of helpful tips for your readers—to a HTML version with pictures, an article, listings of your upcoming events and more.While it’s true that there is more “stuff” clamoring for our attention in our inboxes than ever before—and blogs and social media seem to be the more of-the-moment methods to reach out to potential customers—I still believe that an e-zine is a key marketing tool. In fact, it’s the perfect vehicle for continuing the relationship you’ve begun with people on social media sites or your blog. As much as we would like to think that our prospects or our audience are always thinking of us (wouldn’t THAT be nice? ), it’s unfortunately not the case. Just as a company wouldn’t run a TV commercial just once, repetition is necessary to remind people of you, your offerings and your expertise. No, not that kind. An e-zine gives you a great opportunity to create a feeling of “intimacy” between yourself and your readers by sharing a bit about what is going on with you outside of your business. (Think about what you’ve been up to lately—got anything to share about your recent vacation, your pets, a great book you’ve just finished?) Often people do this in a section at the beginning of their e-zine under a heading such as “A Note From” or something similar. This helps strengthen the relationship with your subscribers by giving them a glimpse into who you are. The more consistently you share information, tips and articles on the subject or niche you are most knowledgeable in, the more credibility you gain in the eyes of your readers. Perceived expertise leads to trust which leads to sales. Frequency: How often you send it depends on how often you can commit to doing so, (how’s that for an answer ? ) but I recommend at a minimum twice a month and ideally, once a week. Remember, you want to stay top of mind above all else. Subject line: Another important part of your e-zine is your subject line. Obviously you want as many people to open your e-zine as possible, so have some fun with this. Think of what would stir up curiosity in your reader—and don’t be afraid to be a little provocative or a teensy bit controversial once in a while. When to send: A common question is “what day is best to send it out?” There is no set answer to this, except to say that I have heard several different opinions on the matter. Tuesday through Thursday is often said to be the best time—however, I know others who send theirs out on Sunday and have a very good open rate as well. You may want to play around and test a couple of different days and see what your results are. No matter what day you choose, know that an open rate of 25% and above is considered good. Your email marketing service will be able to supply those stats. If you’ve been hesitant about putting together your e-zine because you think you don’t have enough content or you don’t have a fancy-looking template, remember, simple is fine. Start with one tip. The sooner you make the commitment to communicate with your list on a regular basis, the sooner you can reap the benefits of that strengthened relationship. Christine Gallagher, The Online Marketing and Social Media Success Coach, is founder of Communicate Value, where she is dedicated to teaching small business owners and professionals how to conquer the overwhelming aspects of online and social media marketing to increase business and maximize profits. To get your free 5-Part E-Course and receive her weekly marketing & success articles on leveraging technology, building relationships and boosting your profits, visit http://communicatevalue.com. Fifth in a series of posts on Marketing Your Resume Writing Services in a Down Market. The Yellow Pages are still a vital source of business for many resume writers, even as more ad budget are being spent online. If your business targets a local clientele, if you are a generalist, and if you work with a wide variety of candidates (from entry-level to executives), the Yellow Pages can be a valuable source of new business. But while it can be important to have a presence in the Yellow Pages, few resume writers are buying the large ads they once did. Instead, they maximize their space by using the Yellow Pages to drive prospects to their websites. Remember, however, that not all prospects will have computer access, so you can't omit essential details by driving them solely to your website. Others will want to make a decision based on the ads they see, and not use the Yellow Pages as a stepping-stone to looking online. Don't forget a strong headline, a benefit ("interviews guaranteed"), your credentials, and a call to action (including a phone number as well as a website address). As resume writer Jackie Connelly, CDF, advised in a May/June 2001 article, "Know your market!" In Long Island, NY, where she operates Prestige Resume Services, most of her potential clients are blue-collar workers. So keep the size of your ad in mind. "When they see a large ad," she notes, "they feel the service will be more expensive for them." Your print advertising opportunities aren't limited to the Yellow Pages, however. You can use small space advertisements in free community newspapers, theatre programs, school newsletters, career-oriented newspapers, daily or weekly news publications, neighborhood association newsletters. church bulletins, city magazines, and university and campus newspapers. Salome Randall Tripi outlined her approach in the same 2001 article on small space advertising. She advertised in her local church bulletin, reaching 400-500 prospects each week. "For 52 weeks, we spent $435 and gained $3,925 in new business as a result," she notes. The key to effective print advertising is tracking your response. If you're not achieving at least a 3:1 return on your investment, you'd be wise to use your ad dollars elsewhere. Addendum to article: If you do work with a local client base, one great thing you can do is register your business on Google Places. Not only will it help your organic search results, but you can measure your traffic and offer time-limited coupons and special offers. 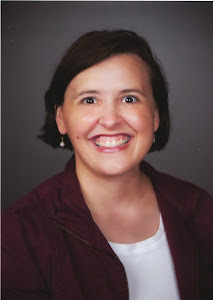 Julie Walraven Blog Post: "Where Did I Put That Resume?" @GayleHoward: #Jobseekers. The first step in any job search is having a clear goal. If you can’t describe what you’re looking for, then you’re not ready. I’d argue any resume writer who doesn’t have a clear client goal isn’t ready to write either. Resume writers tell their clients to network, but don't always follow their own advice. Yet there are more opportunities for business-to-business networking than ever before. Traditional methods include professional associations (especially if you specialize in a niche, making contacts with these associations as well as contacts in academic programs turning out new graduates, is vital), plus business leads groups, alumni groups, and Chambers of Commerce. Your return on your investment here will depend on the time you are willing to commit. Participating in organizational activities, writing for their publication and website, and volunteering to chair committees (membership recruitment and event planning are two in particular), can pay dividends. Another growing area is using online social networking sites to cultivate referrals and build your credibility. Having a profile on LinkedIn or Facebook is quickly becoming essential. If you currently don't have a profile, create one! "PR in Your Pajamas: How to Write a 3-Paragraph Media Pitch"
Are You Prepared for Blogging’s Dark Side? - For resume writers that are building their brand online -- you might not think you're a minor local celebrity (or minor global celebrity), but you should be prepared! "You Already Know Everyone You Need to Know"
My List Building Bank Tip is Online! A few days ago, I mentioned that I had been selected by VerticalResponse as one of their winners in their List Building Bank contest. I was just notified that my tip is now online! You can read it here. This is the third installment in a series on Marketing Your Resume Writing Services in a Down Market. Here is the second blog post in the series. "Speak and Grow Rich!" 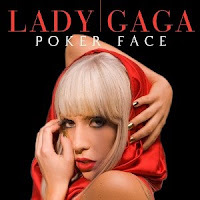 -- That's the title of a popular book by Dottie and Lilly Walters. But it's also a technique advocated by small business marketing expert Robert Middleton in his "Tips for Surviving a Business Slowdown" column in the July/August 2001 issue. Middleton writes, "There are many, many organizations looking for speakers, but they won't give you a call if they don't know you exist. Put together a package outlining your talk and contact every business organization you can find. Send your materials and follow up." What groups are a good fit for a resume writer looking for new business? Any professional organization, for one. Other possibilities are job search networking groups, school and church organizations, and even neighborhood associations. The Walters outline three keys for success in speaking. Remember, though, that the goal of your talk is to generate business for yourself. So don't give away the store! Many resume writers make the mistake of talking about resumes in free talks like these -- when they should be talking about jobs! If the service you're selling is resume services (as opposed to career coaching or interview coaching), don't focus on how to create a resume as part of your talk. Instead, focus on the outcome of having a great resume -- generating interviews and getting the job! As part of your talk, you'll showcase some examples of great resumes for the target market you're working with, and even provide a few tips along the way. But instead of talking about "Resumes for Accounting Careers," you could do a talk about "Networking to Your Next Job in Accounting," or "How to Make the Numbers Work: Salary Negotiation Strategies for Accounting Professions." Or even "Interview Tactics for Accountants: Get the Job and Get Paid What You're Worth!" Among those listed in my state are: Nebraska Association of Nurse Anesthetists, Nebraska Broadcasters Association, Nebraska Council of School Administrators, Nebraska Society of Independent Accountants, and the Nebraska Nurses Association. Prepare a brief cover letter outlining your interest in speaking to their group (for free) on the topic you've developed and include your one-page flier. I'm accepting proposals for 2011 conference presentations. You can download a copy of the Speaker Guidelines at http://bit.ly/dmR2sc. But hurry. The deadline to submit your proposal is Friday, September 24th. Email me if you have any questions. – Great video explaining the process! @GayleHoward: Careers are linked to your life stages. Work situations perfect for one period of your life may be completely wrong for the next. One of the most effective ways to land new business is to write about what you do. In 2001, the emphasis was on print newsletters. This is still an effective marketing tactic, but today's emphasis is online. Publishing a monthly e-newsletter is one thing, but weekly posts to your blog or contributing articles to websites and e-zines can be equally effective. Writing articles can be used to keep in touch with clients and referral sources, to showcase your expertise, and even subtly promote your services to current and prospective clients. In 2008, many people have adopted a "green theme" -- and it's applicable here too. You can also "recycle" what you've written, using the articles in your media kit, as handouts when you deliver workshops, and including them with other information you provide to prospective clients (either in person or online). The key in writing articles is to inform, not sell. You want to establish a long-term relationship with current and potential clients. Your recipients will appreciate the information, and you'll be building credibility at the same time. You can provide career-related tips or strategies; introduce new services; provide professional advice (a "Q-and-A" format is particularly effective); and offer inspirational quotes. Don't get too ambitious. In an article on client newsletters in the July/August 2001 issue of Resume Writers' Digest. Tracy Bumpus, CPRW, JCTC, of RezAMAZE.com, talked about the content of her monthly opt-in electronic newsletter targeted to high-tech professionals and engineers. "I usually have one primary job search or career-related article that I write myself," she noted. Her newsletter also features "Humor Byte" and "Nuggets from the Net," a compilation of relevant information culled from various tech sites. You can also write for professional association newsletters or provide articles for their websites. Consider trading articles with professionals in other industries, such as accountants, attorneys, real estate agents, and even mental health therapists (especially those that provide career testing and coaching, if you don't). Whether using a print or electronic format, keep your articles short, simple, informative, and helpful. If you're producing an online newsletter, remember that consistency in publishing is critical. "Getting my name out there plays a significant role in referral rates, marketing standing, and branding," Bumpus adds. "If I only distributed it every six months, I'd be wasting my time." Next in the series: "SPEAK AND GROW RICH!" If you'd like to purchase this issue of the newsletter, the cost is $3. Order here. MediaBistro Article: So What Do You Do, Seth Godin, Author and Marketing Guru? - I didn't know Seth had sworn off traditional publishing. Interesting. Resume writing is a truly recession-proof industry. In a good economy, job seekers look for "greener pastures," trading in old jobs for new. In a bad economy, worried job seekers update their resumes to prepare for layoffs. How you market and price your services during a downtown or recession may different, however. Clients who would be willing to pay for "the works" (resume, cover letter, interview coaching), when times are good may be reluctant when times are tough. But in a competitive hiring environment, "pulling out all the stops" may just be what is required to set the jobseeker apart from the crowd. However, instead of selling a complete package upfront, all at once, you may sell it in stages -- first the resume and cover letter, then the interview and job search coaching, and finally, salary negotiation coaching -- perhaps paid weekly or via installments on a credit card. In a tough economy, the job search also takes longer, and your clients may need more reassurance along the way. Consider starting a monthly e-mail newsletter, geared towards helping clients with their job search as much as drumming up new business. 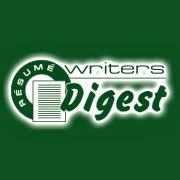 To provide guidance on time-tested strategies that work in a challenging economy, I turned to the Resume Writers' Digest archives -- to issues from 2001 and 2002, when resume writers faced similar economic struggles. I also incorporated in new tips, particularly in regard to online and electronic marketing techniques, since technology has changed quite a bit over the past 6-7 years. First up is "WRITE! PUBLISH! PROFIT!" - I’ve never see this articulated anywhere else, although I’ve seen associated blogs before. Great Roundup of Twitter-related job search resources, assembled by Deb Dib and maintained by Job-Hunt.org. @Dave_Carpenter: Don’t die with your book still in you. I Won a Book from Vertical Response! I had to share the news with you guys! Last week, I submitted a tip to the VerticalResponse List Building Bank Giveaway. I was one of 10 tips selected to be featured, and I won a book -- "The Referral Engine " by John Jantsch! As those of you who received the Resume Writers' Digest newsletter know, I use VerticalResponse to manage my RWD mailing list. I like it because I can purchase email credits and use them whenever I want, instead of paying a flat fee per month. If I don't send an email in a particular month, I don't pay anything! When I want to send an email, I just buy some credits (and they have a tiered payment program, where the more credits you buy, the less you pay. I usually pay $.015 per email credit (or $15 per 1000 credits), and since my list is about 800 names, I can do a mailing for about $12. They also have a "standard" option -- as little as $10/month for unlimited e-mailing. Give it a try -- here's my affiliate link to sign up for an account -- you'll get a 30-day risk free trial. They also offer survey subscriptions and postcard mailings. As you can tell, I love VerticalResponse! Give them a try ... and I'll be sure to put up a link to my list-building tip when it gets published. Today's question is: Do you want me to provide some commentary with the articles? Like a sentence or two on what it's about, and why I thought it was cool/interesting? Let me know. Comment below. Jason Alba blog post on I’m On Linked In – Now What? "Who Owns Your LinkedIn Profile"
Michael Lunsford blog post (via Julie Walraven): "The Best Success Story I’ve Ever Heard: Burn That Star Wars T-Shirt"
Denise Wakeman (The Blog Squad), article on Biz Tips Blog: "Keyword Research Can Help Your Content Get Found by Your Ideal Client"
"Hire Me: Your Employment Prospects for 2010 (Results of Manpower Survey)"
Avid Careerist Blog Post: "How to Use Google Alerts in Your Job Search"
Resume Confidential (Karen Siwak) Blog Post – "A Conversation with David Graziano– Social Recruiting Strategist"
Via @TheJobQuest RT @steviepuckett: Your job security no longer lies in having a job. It lies in knowing how to work the job market. I had the idea to do blog posts for each day that are kind of like "Google News" -- they give you a brief summary & a link to some of the best "found" content I came across today. Annemarie Cross blog post: Find yourself spying on your competitors? Have you fallen into the competitor comparison trap? Melissa Cooley blog post: How to deal with good friends that send you bad job listings. Tim's Strategy article: How to promote a conversational job interview. What if you could add revenue each year to your business with very little work? That's the promise of affiliate marketing. I'm doing a free teleseminar for Maria Hebda's "Career Experts Online" series on the topic on Sept. 22. Will you take 2 minutes and help me by answering a few questions in my survey? Thanks to those who have already responded to my plea (via e-mail, Facebook, and/or Twitter) to take the survey. There is also a discussion board for West folks on the Work-at-Home forum. The blog on Work at Home Moms has a state-by-state listing. Here's Nebraska's. Xerox has made a serious commitment to allowing about 10% of its workforce to work from home. Check out available positions here. Also check out Amazon's work-from-home jobs. Some of them are seasonal. Also, if you are a resume writer who is looking for work at home (subcontract) opportunities, purchase my "Making Money as a Resume Subcontractor" Special Report. It lists several dozen subcontracting opportunities, including qualifications, type of work performed/specialties, turnaround times -- and, for many contracting firms, pay. There are a couple of natural, built-in times each year for resume writers to re-evaluate themselves. And re-evaluation of yourself and your professional life/business are essential. The first is New Year's. Just as our clients make New Year's resolutions, so should resume writers. You already know how important goal-setting is to your personal and professional development, so I won't harp on it. The second is the Fourth of July holiday. Coming mid-year, this is an ideal opportunity to you to evaluate your progress thus far ... and to take another look at those New Year's resolutions. What's my next move for my career? Which of my greatest strengths is most differentiating for me, and how can I integrate that strength into everything I do every day? What one energy-zapping activity can I stop doing when I return to work? All great questions -- and ones that I advise that you take just a few moments to consider. The Career Management Alliance is looking for speakers for their 2011 Conference, Thursday and Friday, April 7th & 8th, 2011 at the Riviera Hotel & Casino - Las Vegas, NV. economic climate and tomorrow's uncertain outlook. that we stand out from the crowd and get noticed. I came across some good resources in Susan Friedmann's book, 'Riches in Niches ' and thought I'd share them with you! What Makes a Good Workshop? How many typos does it take before the person reading the resume will put it down and move onto the next resume? One? Two? More than two? A survey from Accountemps makes it clear. Three out of four (76 percent) of executives interviewed said just one or two typos in a resume would remove applicants from consideration for a job; 40 percent said it takes only one typo to rule candidates out. The full survey results are in the Summer 2009 issue of Resume Writers' Digest. After reading Career Distinction by Kirsten Dixsen and William Arruda, I became interested in digital distinction and online branding. Then, on Kirsten's Facebook page earlier this week, she posted a link to an Online Identity Calculator. The results of the calculator matched the results of my assessment when reading Career Distinction: I'm digitally distinct! 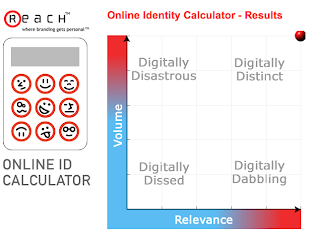 Digital distinction is a measure of your online profile at any given point in time. 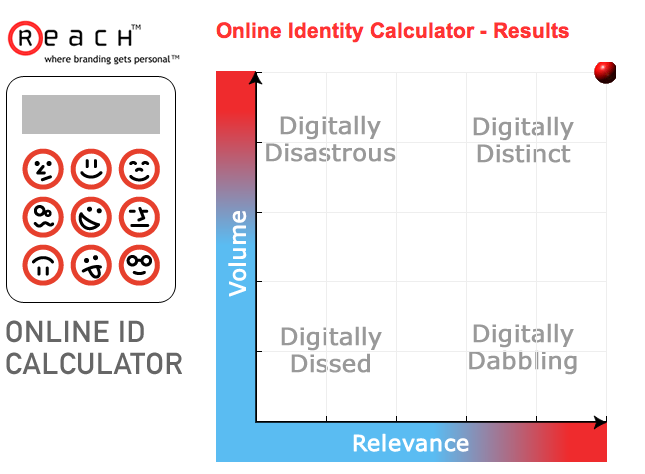 As Kirsten and William define it, "The online identity calculator measures the effectiveness of your online identity and places you on our digital scale. Knowing where you stand today will help you determine exactly how much work you have to do and your next steps." They go on to say that, "Where you fall on the digital scale is based on a combination of volume and relevance. How many results do you get? How many of those webpages actually pertain to you? Do the references to you on the Web communicate a positive, negative or neutral image of you? How consistently do those results communicate what you want to be known for?" The majority of results that come up for me are aligned with my personal brand -- primarily my work with Resume Writers' Digest. This is the area of my business that I want to continue to focus on growing, so it's encouraging to me to see how my online brand profile appears.